and Cranky Employees and Customers! Whether youre a CEO, a consultant, manager, specialist, or generalist, you naturally have a burning desire to improve your companys bottom line — and enhance the working conditions and camaraderie of those around you. When circumstances arent ideal, people experience obstacles to productivity that lead to frustration. Remaining blissfully unaware of those conditions can decimate morale and dissolve organizational effectiveness like corrosive acid! Have you ever noticed any of the following? Fortunately, theres a simple prescription you can follow that will cure those symptoms, and dramatically boost productivity, effectiveness, and enthusiasm! Align signals in the organization, so everyone knows whats expected of them and what will happen as a result! Price: US $21. Click now to get instant access! Expand personnel expertise — What should people learn to help the entire organization achieve its goals? How should you integrate learning with work? Youll learn several low-cost, feasible ways to help people grow on the job. Design efficient, reusable processes — Creating robust systems and processes in your organization is crucial for laying a foundation for success. Youll find seven important tips and shortcuts that will make this practice painless. Design information to help people act quickly — Youll tap into industry secrets for helping people learn and apply on the fly. These include several leading-edge ways to design, format, and organize your information to maximize learning, retention, and application. Implement electronic performance support systems — Digital performance support tools can stretch personnel expertise, shorten the learning curves for new hires, and preserve your organizations knowledge. Discover several ways to exploit this powerful approach! Eliminate obstacles to productivity — When people know how to do their jobs but can’t seem to function effectively, its often due to obstacles that block their path. Learn how to recognize and remove these hurdles to dramatically increase effectiveness and morale. Capture and apply lessons learned — Find out how to use this technique regularly to help preserve the priceless intellectual assets in your organization, mitigate the negative effects of attrition, and greatly shorten the time that employees need to solve problems. Align consequences to walk your talk — If you (or others) say one thing but do another, it sends mixed signals to employees and customers and produces mediocre results. Find out how to stop and reverse this problematic trend before it totally destroys morale! YES, Adele  I want to order your Productivity Success Kit right away so that I can start multiplying the morale and effectiveness in my organization! 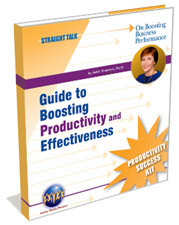 I strongly believe that this tool kit will help you optimize productivity and set the conditions for success in your organization, enabling people to do their best work. The stronger the foundation for success, the more satisfying everyone’s efforts will be, and the more profitable your business will become!